All over the world, in some form or another, a pollution prevention hierarchy is incorporated into recycling regulations, solid waste management plans, and resource conservation programs that include recovery prior to landfill. Many organizations focused on this 4th R instead of the top of the hierarchy resulting in costly systems designed to destroy materials instead of systems designed to reduce environmental impact and properly manage resources. Because of this, along with other resource destruction systems that have been emerging over the past few decades, the Zero Waste International Alliance adopted the only internationally peer reviewed Zero Waste Hierarchy that focuses on the first 3 Rs Reduce, Reuse and Recycle (including Compost). 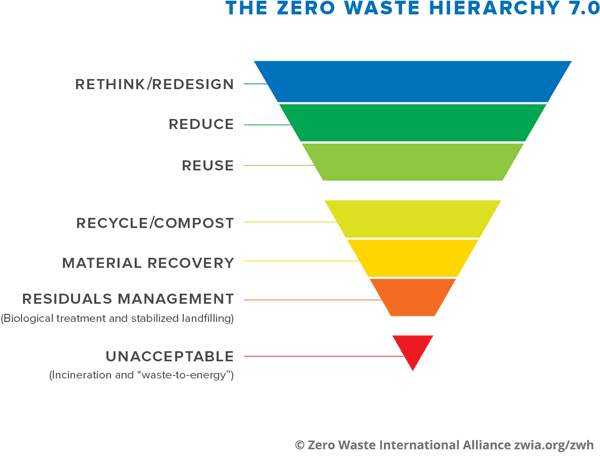 The Zero Waste Hierarchy describes a progression of policies and strategies to support the Zero Waste system, from highest and best to lowest use of materials. It is designed to be applicable to all audiences, from policy-makers to industry and the individual. It aims to provide more depth to the internationally recognized 3Rs (Reduce, Reuse, Recycle); to encourage policy, activity and investment at the top of the hierarchy; and to provide a guide for those who wish to develop systems or products that move us closer to Zero Waste. It enhances the Zero Waste definition by providing guidance for planning and a way to evaluate proposed solutions. Support and expand systems where product manufacturing considers the full life-cycle of their product in a way that follows the Zero Waste Hierarchy and moves towards more sustainable products and processes. Producers take back their products and packaging in a system that follows the Zero Waste Hierarchy. Ensure minimization of impacts by means of biological stabilization of fermentable materials. Rethink / Redesign What has led us to our present linear use of materials and thus, what needs to evolve to move towards a closed loop model? How do we re-design systems to avoid needless and/or wasteful consumption? Reduce What supports the use of less material and less toxic material? Reuse What supports the better use of those products we already have in ways that retain the value, usefulness and function? Recycle/Compost How do we ensure materials are put back in the materials cycle? Material Recovery What was salvaged from mixed waste? Residuals Management What is still left and why? What do we need to take out of the system that should not have been circulated in the first place? How do we manage what is left in a flexible manner that continues to encourage movement towards Zero Waste? Unacceptable / Regulation What systems and policies encourage wasting and should not occur? Closed Loop Systems Design systems to be closed loop rather than linear in their use of resources. Close to Source Processes to occur as close to the source as practical. Conservation of Energy More energy can be saved, and global warming impacts decreased, by reducing waste, reusing products, recycling and composting than can be produced from burning discards or recovering landfill gases. Do NOT Export Harm Avoid the export of toxic or potentially toxic waste or materials to poorer less developed nations and avoid the export of materials with limited, undefined recycling markets that will be either landfilled or incinerated in another region. Engage the Community Promote changes and systems that work with communities to facilitate meaningful and sustained participation, increase understanding, and influence behaviour change and perceptions. Highest and Best Use Creating and keeping materials and products for a use as high on the hierarchy as possible and in the useful loop as long as possible. Keeping materials from being downcycled where the number of future uses or options are limited. Information & Improvement Collect information on systems and use as feedback for continuous improvement. Local Economies Support the growth and expansion of local economies (production, repair, and processing) in order to reduce greenhouse gases from transportation, improve accountability, and increase repair and parts opportunities. Materials are Resources Preserve materials for continued use and use existing materials before harvesting virgin natural resources. Minimize Discharges Minimize all discharges to land, water or air that may be a threat to planetary, human, animal or plant health, including climate changing gases. Opportunity Costs Consider opportunity costs of investments and ensure investments occur as high as possible on the Hierarchy. Precautionary Principle Ensure that a substance or activity which poses a threat to the environment is prevented from adversely affecting the environment, even if there is no conclusive scientific proof linking that particular substance or activity to environmental damage. Polluter Pays Whoever causes environmental degradation or resource depletion should bear the “full cost” to encourage industries to internalize environmental cost and reflect them in the prices of the products. Sustainable Systems Develop systems to be adaptable, flexible, scalable, resilient, and appropriate to local ecosystem limits. Biological Temperature and Pressure The ambient temperature and pressure that occurs naturally without the use of added energy, or in any case not above 100 degrees Celsius or 212 degrees Fahrenheit. Unless higher temperatures are required, not to exceed 150 degrees Celsius, as a pretreatment (e.g. to control diseases, or reduce pathogens) to be then subject to composting or anaerobic digestion; the pretreatment should never be used to destroy materials. Circular Economy An industrial economy that is, by design or intention, restorative and in which material flows are of two types, biological nutrients, designed to re-enter the biosphere safely, and technical nutrients, which are designed to circulate at high quality without entering the biosphere. Materials are consistently reused rather than discharged as waste. Closed Loop System A system not relying on matter exchange outside of the system, as opposed to open loop where material may flow in and out of the system. Destructive Disposal Discarded materials placed in a landfill or in an Incineration** facility. Diversion An activity that removes a material from Destructive Disposal. Incineration Incineration is a form of Destructive Disposal via combustion or thermal conversion/treatment, using temperatures above 100 degrees Celsius, of discarded materials into ash/slag, syngas, flue gas, fuel, or heat. Incineration includes facilities and processes that may be stationary or mobile, may recover energy from heat or power and may use single or multiple stages. Some forms of incineration may be described as resource recovery, energy recovery trash to steam, waste to energy, energy from waste, fluidized bed, catalytic cracking, biomass, steam electric power plant (burning waste), pyrolysis, thermolysis, gasification, plasma arc, thermal depolymerization or refuse derived fuel. Minimize Gas Production and Release This means keeping out source-separated organics as much as possible and biologically stabilizing the materials that go into landfill. For existing landfill cells that already contain unstabilized organics, the gas production should be minimized by keeping out rainwater and not recirculating leachate. Minimize methane release by permanently capping closed cells with permanent covers and installing gas collection systems within months of closure (not years). Maintain high suction on collection wells and do not damp down wells or rotate off the wells to stimulate methane production. Filter toxins in the gas into a solid medium that is containerized and stored on site. Note that this is not considered a renewable energy. Problematic for a Closed Loop System Materials that make it hard to recycle or compost the materials themselves or other materials. These may be contaminants for a material (like some forms of biodegradable plastics or stickers on fruit and vegetables) or materials that clog processing systems (like plastic bags). Responsibly Managed Landfills Manage landfills to minimize discharges to land, water or air that are a threat to planetary, human, animal or plant health. This must include plans for closure and financial liability. Sustainable Purchasing The purchase of goods and services that take into account the economic value (price, quality, availability and functionality) and the related environmental and social impacts of those goods and services at local, regional, and global levels. Value The importance, worth, or usefulness of something that may be economic, social, environmental, or sentimental.